First of all, I would like to thank Linda for inviting me to participate in this healing blog. It is my honor to share some of my experience with music, sound and vibration. My intention is to share experience that can hopefully assist on the journey of healing from a brain injury. 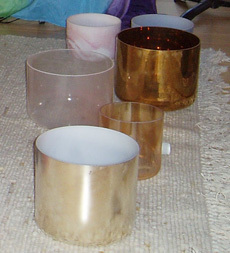 I have developed a method of brainwave entrainment primarily using the quartz crystal singing bowls as well as my voice. I have also recorded some music that can assist in the healing process. I have worked with thousands of people in individual sessions and groups. A small group of those folks have had brain injuries. Though the number of people dealing with this ailment has been small, I have learned much from working with these courageous folks. I have never had a serious brain injury. I have had a concussion. That experience has definitely given me great empathy and compassion for those suffering from a brain injury. It has given me, humbly, a taste of what it must be like to have that experience. I can only hope by sharing some of the journey with clients and also in my personal life, that there will be at least one tool in here that can hopefully improve this condition. Not all sounds are created equal, and yet there are some sounds that can help immensely. The path is profound, and not always easy, but it is important to keep going, never give up, and listen to the bread crumbs of our inner knowing that allow the Higher Self to be heard in this world. Sound, music and vibration are not just the languages of the universe, but also the architecture of the Cosmos. The way sound operates in the universe, between the Earth and Sun, and also the relationship with other planets, is the same way sound works in our physical bodies. We are a microcosm of the macrocosm. As above, so below. There are certain truths that we do not have the perception to see that happen all around us. Most of us do not notice that the Earth is spinning 1000 miles per hour. We do not even think about it. The Earth also moves around the sun at over 67,000 miles per hour while the Earth orbits the Sun. The Sun is also in orbit around the Milky Way galaxy. The Sun moves around the Milky Way, taking all the planets and moons with it, at over 600,000 miles per hour. From our perspective, we do not perceive any of this amazing movement. Why do I write of this? It is two-fold. One is, I would like to explain the musical relationship of the Cosmos and our physical bodies, and how understanding that relationship can be part of being more conscious about life, our lives, and ultimately, consciousness. Consciousness is a form of healing. It is part of the process of healing. Besides the musical relationship, I ask, if we are to continue having this cup of tea and conversation together, that you simply stay open. Part of the gift of incorporating sound and music as a form of healing and the integration of mind, body and spirit, is that sound literally builds new neurological networks that connect the left (logical) hemisphere of the brain with our right (intuitive) hemisphere of the brain. The more neurons you have firing, the more neurological networks that a person has that connect the two hemispheres of the brain, the more the perceptual doors open, allowing logic and intuition to open the perceptual doorways, allowing us to make better choices, not just the choices we have made before. We know where those choices go. We have been down that road. But what gets us to where we are going is not what we know, but what we do not know. Therefore, being open is key to evolving, and it is key in allowing healing to take place. Too many times we make choices from our logical mind. Many choices that are correct for us are not always logical. Miracles literally take place each day, and miracles do not make sense. All I ask is that as we sit here, having this cup of tea together, that you remember that tea bag that went in your cup of tea. That was alchemy. Making a cake is alchemy. You are following a recipe, taking ingredients, and getting an outcome that has literally changed the composition of the original state of the ingredients. I have seen sound do the same thing to the human body, mind and spirit. Though sound is not visible, it is visible in the sense of how it shifts what is visible. Sound, music and vibration can be considered a form of energetic nutrition. Receiving a sonic massage is something that can not only shift your body, but your mind. And since there is no separation, we need to take all of this into consideration when making choices. Please remember there is no separation between how we live our lives, how we spend our time, what choices we make, and how we heal. How we spend our free time is how we grow. So with our cup of tea, let’s go back to the universe for a moment. Let’s start with the Earth. Many years ago, a group of Russian and American scientists went out into space together, and decided to measure the Earth in terms of sound and vibration. They discovered that the Earth’s circumference resonates at 7.2 Hertz. In musical terms, that is a very, very low F, an F that would be lower than any F-note on a piano. Let me also just say briefly that you can think of Hertz as a cycle, or a wave. If we were looking at the ocean, and counted the waves in a minute, we could describe those waves by saying cycles per minute. Because the brain moves much more quickly, we say Hertz, or cycles per second. Long ago, Kepler discovered that the Earth as a whole resonated at 136.1 HZ, which is a little above a middle C, and a little bit below a C#. Do not worry about the notes. You do not need to read music to understand this. Basically this means that the Earth resonates at a fifth. Anyone who has seen the movie, “The Sound of Music” may remember the song, “Do Re MI.” The musical relationship of the Earth would be “Do Re Mi Fa Sol.” It is an interval of music that is seen over and over in the universe, in our physical bodies, and in almost every variety of music, including classic, pop and rock. The Sun, which is basically a huge gaseous ball, also resonates at a fifth. There is a solar umbilical cord that connects the Sun and the Earth, and that too, resonates at a fifth. I would like to have you imagine that music is a direction. It can either come or go. A fifth is more yang. It is an interval of music that the Romans would bugle to the soldiers to get them motivated to go to battle. It is in a way an alchemical interval of music. It can shift the brain, the heart, and the entire physical, emotional, and mental bodies, as well as the spiritual aspects of our Higher Self. Let’s talk about how it affects the physical body. When we hear the musical interval of a fifth, that fifth literally shifts the harmonic rhythms of the heart, and then through the Vagus nerve literally travels to the temporal lobes of our brain and begins to slow our brain states. The sound or music enters through the ear, strikes the eardrum, and is then transduced into neural activity in the brain. Neural networks carry the stimulus of the sound down into the brain stem and to the medulla oblongata where it is routed into the Reticular Activating System. This is where we now start to connect the dots to brain injuries. The RAS is mostly a system of sensory arousal. When a new and novel stimulus appears, it literally drives the brain into a more alert state. This increases in the beta activity, which is a more enlivened brain state, and also activates the sympathetic nervous system. When you are driving down the road, you are mostly in a beta brain state, and not aware of the physical body, and putting perception on what is in front of you on the road instead of what you are feeling in your body. It is important to state, however, that the brain is never in one brain state. Brain cells cluster together, and we can be in alpha, theta and beta all at the same time. It is just crucial that we have enough alpha and theta brain states to bring about the states of consciousness that can enhance well-being. When a sensory pattern is repeated, or if the timing of the sensory pattern is within certain tempos, the RAS tends to become habituated to the pattern and then decreases alertness. Think about the times you have fallen asleep in front of the TV. On some level you got used to this sound. This generally increases the alpha and/or theta brain activity, and also stimulates activation of the parasympathetic nervous system. You can think of alpha and theta as the magic window of healing. Alpha brain waves allow the person to be aware of the external world, yet still feel the sensations of the body. Theta is more like a lucid dream state, where the internal world becomes so real that the external world cannot be perceived, and therefore the world we are perceiving in the dream state becomes real to the body, as if it is happening in “real” time. The brain cannot tell the difference between dreaming that the person is playing the piano or playing a sport, versus physically partaking in that activity. When someone has a brain injury, often what will happen is their reticular activating system stays activated, meaning they are on constant alert. Loud sounds can be challenging, and will sound louder to that person than they did before. In fact certain sounds can become intolerable. There is also a good chance that there can still be cortisol in the body from the trauma. Cortisol will flood the area of trauma to numb out the pain. Cortisol is activated when we go into a fight or flight situation. With animals in nature, psychologist, Peter Levine, discovered in his studies that animals can usually recover from a trauma relatively quickly, because they know how to release the cortisol. Humans, however, will sometimes not be able to feel the sensations of their body, will stay in the head, and therefore will not give themselves the opportunity to release the cortisol. Many years ago I was in a car accident, and kind of mentally brushed off the fact that it was scary and quite traumatic. I had done a 360-degree spin on a steep mountain pass, and the truck I was driving hit a snow embankment. If the car had spun the other way, I would have gone over a cliff, down a mountainside, and probably would have perished. Exactly 24 hours later, my body went into physical convulsions. I shook for a total of five or six minutes. I recognized at the time that I was releasing the cortisol from the accident. It was a huge gift. Not releasing the cortisol keeps the Reticular Activating System activated, which means that person is in a constant state of stress. It has been a little tricky being able to use sound and music to alleviate the trauma of a brain injury. I say tricky because often what can be challenging for us can also turn out to be a gift. I have had my own sound healing experiences that were not physically easy in the treatment, but actually allowed the release to happen, kind of like riding out the wave of a tight muscle during a massage. However, having an awareness of how music, sound and vibration operate in the Cosmos, as well as the different intervals of music, I would like to share with you what I have found to be effective. Besides the musical interval of the fifth, there are other intervals of music that have a different “timbre,” a different feel, a different perspective shall we say. The Romans knew a fifth was very yang, it gave a tour de force, a sense of movement, a direction of going forward. It is a sound that amplifies the energy of a situation. The same goes for rhythm. There are certain rhythms that really move energy. Most rock and roll is played in 4/4 time. It allows things to really move forward. As my friend and colleague, Dr, Dean Lloyd (http://www.acutone.com/ ), has stated that in music, you are either coming or going. Both of these examples, the fifth, and 4/4 time, raise the energy. They enliven, just like the Reticular Activating System becomes enlivened when a new sound shows up on the scene. Music can also go in another direction. Music can also sedate, slow down and help us remember, to bring us back home. There is something in music called a third. Let’s go back to the Sound of Music. “Do Re MI” is a third. Let’s take that third and go back in the other direction. “Mi Re Do”. If we take that third and go back to the original note the tonic or root, back to where we came from, something magical happens. The brain slows down, it sedates, it calms. A similar condition occurs when we dance in a 3/4 time or listen to music with this rhythm. This is the same rhythm as a waltz. This particular rhythm is so powerful that in the Middle Ages it was considered a sin to sing, play or compose this rhythm of music. It is very yin. 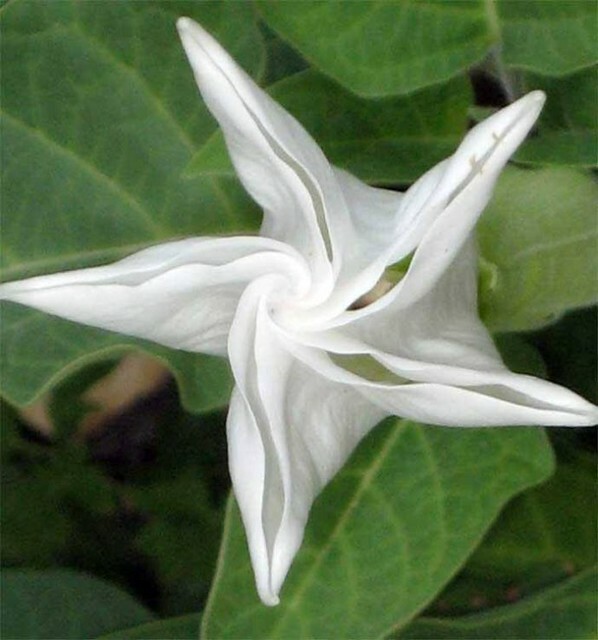 It is very feminine. It is the meter of the Divine Feminine. So let’s put this all together as far as experiencing a sound session. Any music that makes you feel really good is music that is healing for anyone with a brain injury. So as I share information about fifths, and thirds, please just know that music you love to listen to is doing you some good. However, having said that, it is important to also not play the music too loudly; about 30 decibels is usually loud enough to have an effect. That has a similar level of loudness as a loud whisper, or speaking softly. Please remember, I am sharing tools. There is no concrete system, there are no rules. Whenever a therapist is holding space with sound, the primary goal is to observe the person to see which sounds are working for them. If the person’s respiration, heart rate and brain states start to slow, then I know that the sounds are working for them. One way to see if the person’s brain states are slowing is if you notice rapid eye movement happening, or if they state that they are seeing colors. Rapid eye movement is indicative of theta brain waves occurring. Seeing colors is demonstrative of the sound and music being integrated into the nervous system. If they seem to be in a more enlivened state after a while, then they are probably done with those sounds and are ready for another form of sound nutrition. On some level, that person knows exactly what they need. My job is to observe, watch, and follow their body song. As far as the quartz crystal singing bowls, one of the reasons they are so therapeutic is because of the harmonic overtones. There are 16 harmonic overtones that the human ear can hear from one note. They go on infinitely, but we cannot hear them all. When we listen to the singing of a bowl, we are hearing what we call the fundamental or root note, but we are also hearing many different musical intervals of music within that one note, which are the overtones. These harmonic overtones literally start to shift the brain states into that magic window of alpha and theta. The root note is the lowest note. The harmonic overtones move in an upward direction above the root note. It is important to play them softly. I call utilizing sound in a session a “sonic massage.” The sound literally goes through the entire body. You can literally feel the sound going all the way through. That is the vibration. With a regular massage, we bump up against muscles and other tissues. The sound and vibration are carried by something called the essentic wave. It is similar to how massage works. This “wave” works through touch and sound, which is why when we receive a Swedish massage our brain states slow. It is the same with a “sonic” massage. 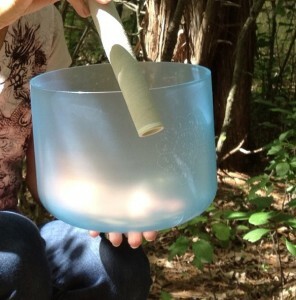 When playing the quartz crystal singing bowls, I find it is better to sing the bowls rather than chiming. Singing means playing the rim of the bowl with a striker, which is made of a hard resin and covered with a suede-like fabric. Chiming seems to activate the Reticular Activating System, unless the chiming is very soft. We are looking for sounds, and actually vibration, that will activate the parasympathetic nervous system. Calm, slow, soft, sweet sounds. We are not going for dissonant sounds. We are looking for peaceful harmonizing sounds. Sometimes dissonant sounds can allow dissonant feelings to come to the surface. But for this purpose, let’s stay with harmonic sounds. Again, it is so important to literally ride the wave of sound. Sometimes sound healing sounds are not pretty. Sometimes they are. Again, in general with brain injuries, I tend to keep the sounds soft and melodious. From there, you can expand. It takes at least 10 to 12 minutes for the brain states to start to slow through music. As long as you are checking in with the person, and they know they have the freedom to speak up and say what is working and what is not, then you can build a solid foundation of trust and musical healing. As far as length. Less is more. It is better to not overdo it. More and more people are enjoying the bowls not just in session work, but they are wanting to be able to continue the work in the comfort of their own home. I have developed a line of quartz crystal singing bowls that have ancient mandalas etched on them, mandalas that amplify the energy of healing. These are unusual-looking mandalas. These cannot be found on the Internet. A mandala in a sense, is frozen music. Any geometric pattern emanates a certain kind of energy, depending on the geometric pattern. This is a form of cymatics, but instead of sand, we are etching the patterns onto the bowls. Emoto has shown a similar theory with water crystals. 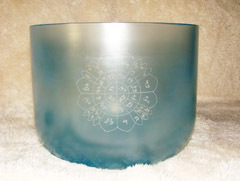 There are several mandalas currently that have been etched on the gemstone bowls to accelerate healing. Some of the mandalas also have a mantra that can be spoken or sung with it, which is another wonderful way to incorporate sound. Anytime you speak or sing, you are giving yourself a sound massage from the inside out. Again, please be mindful of what is sung or spoken. One of the easiest ways to cause dis-ease in the body is to curse or swear. Research has shown when you swear, you literally kill your own cells. It is so culturally accepted to swear. Eliminating these words, just this simple thing, can mitigate quite a bit of pain and suffering to the body, and our being. I would like to share one more thing. In this blog, I have shared quite a bit about the brain, since the topic has been how to treat a brain injury with sound. I think it is very important to remember that the heart’s electromagnetic field is much larger than the brain. In general, as a culture, we tend to celebrate our pain and suffering more than our joys and accomplishments. It is part of our history, our ancestry, and it can be part of the human condition. I have seen inner strength and empowerment be a catalyst for more peace and happiness to come into the lives of people. I am not talking about the airy approach of let’s think positively. Yes, absolutely, having positive thoughts can help. But even that falls into the old pattern of duality, of negative and positive. I am talking about the deeper knowing of nurturing inner strength. Inner strength and empowerment are the roots of true happiness, and the branches of consciousness. One simple practice that can be done is to eat your favorite food once a week, or watch your favorite movie eating your favorite food. Or listening to your favorite song for two straight hours, to train yourself to go for the inner joy and strength, and not fall back on the old patterns of suffering. All of these exercises will raise your consciousness and make it easier to find your own answers. Years ago, while studying with my mentor, there came a six-month period where I was stuck in my lessons. I just could not find the answers. I was to look at a mandala, and explain to my mentor the purpose of the mandala. There was nothing in the design of the mandala that was going to let me “figure it out.” The only way I was going to get the answer was if my mind was clear, and my heart was open. I “guessed” for literally six months. I finally decided to sign up for a private day with my mentor, Dr. Mitchell Gibson, fly to the East Coast, and spend the day with him and his wife, Kathy (www.tybro.com ). One of the exercises they asked me to do was to look at myself in the mirror and look into both of my eyes. What I saw was a split. One eye was genuinely happy. The other was not, and looked kind of dull and sad. I had a duality in myself that was not letting my consciousness rise to the occasion, because some part of me was used to suffering. As soon as I acknowledged this in myself, I decided to try the mandala again. I “heard” the answer to the mandala in 20 minutes. Twenty minutes! I had raised my consciousness to the point where I could “know” the answer within myself. This was huge. I tried another mandala. I got that one in ten minutes. I passed my lesson in a half hour. Previously, I had suffered my way through the lesson for the past six months, and did not move forward. By raising my consciousness, by becoming consciousness of that part of myself, everything shifted. Yes, sometimes I still fall back into the old suffering, but I stay there for a lot less time, and my choices keep getting better. There are more brain cells in your brain than stars in the known universe. Each brain cell is like a seed. That means you are a seed, and every seed is a potential. Each one of those brain cells is a possibility. The cells in your heart also “think.” They are very similar to brain cells. I ask you, with your voice, your heart, your ears, your eyes, with all of the beautiful tools you have that are innately you, what is your knowing trying to tell you? I can only imagine the journey you have been on, through this event called a brain injury. Music, the universal language of Humanity, and the Cosmos, can be the catalyst for direct experience shifting the body, mind, emotions and consciousness. My wish for you as you walk through the forest of ice is simple; that the crystal clear clarity come in the form of just the next step. Wherever you are, begin there. I trust your heart’s knowing, as you pray with your feet, and take that next step. Thank you so much for sharing this cup of tea with me, in the alchemy of life. It is a humbling, extraordinary journey we are taking. This entry was posted in Brain Injury by admin. Bookmark the permalink.